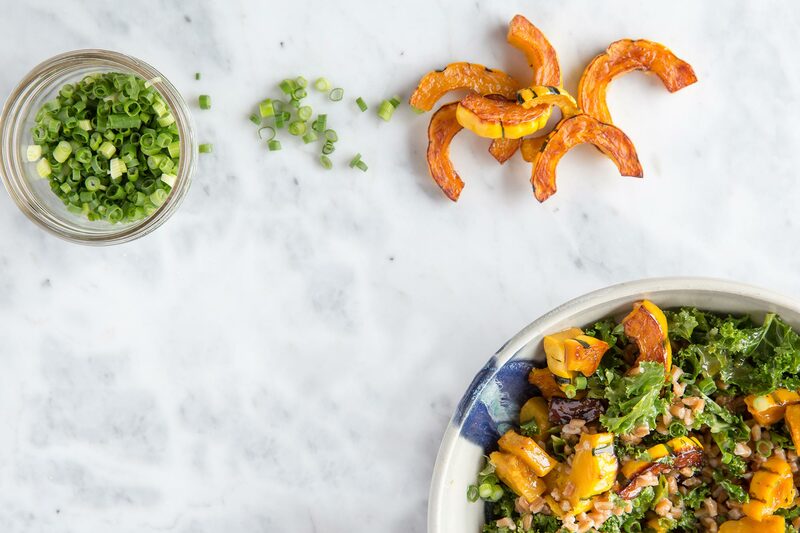 When we initially came across this grain bowl recipe, it seemed too simple to be delicious, but it marries the sweetness of roasted Season:Winter squash with the savoriness of miso and curry and the complexity will surprise you. This dish is perfect for a weeknight meal and leftovers hold up great for next day lunches. Preheat the oven to 400 degrees F with a rack in the middle. Bring 4 cups of water and a pinch of salt to a boil in a saucepan. Add wheat berries, reduce to a simmer and cook until tender, approximately 45 minutes. Drain and spread wheat berries on baking sheet to cool. Cut the delicata squash in half lengthwise and use a spoon to clear out all the seeds. Cut into 1/2 inch thick half-moons. If using a different Season:Winter squash, peel as needed. In a medium bowl, whisk together olive oil, miso and curry paste. Combine the potatoes and squash in a large bowl with 1/3 cup of the miso-curry paste. Use your hands to toss well, then turn the vegetables onto a rimmed baking sheet, and arrange in a single layer. Roast for 25 to 30 minutes, until everything is tender and browned. Toss once or twice along the way, after things start to brown a bit. Keep a close watch, though, the vegetables can go from browned to burned in a flash. In the meantime, whisk the lemon juice into the remaining miso-curry paste, then stir in the kale until coated. You can also sauté the kale first if you prefer. Toss the roasted vegetables gently with the kale, wheat berries, green onion, cilantro and pepitas (if using). Serve family style in a large bowl or on a platter.